The growing Senior School facilities at Cedar College underlines the need for quality resources, in order to meet the requirements of today’s broadening curriculum. Specialist facilities for 21st Century learning including a new Resource Learning Centre, a new Creative Arts Centre incorporating Music and Drama, and a new four-laboratory Science wing. Other High School facilities that were completed recently include: The Cedar College Sports Centre (incorporating a two-court gymnasium with spectator seating as well as fitness and change rooms), Food & Hospitality Centre (featuring commercial kitchen facilities and separate dining area), High School Art and Design rooms, Instrumental Practice rooms and recording studios. 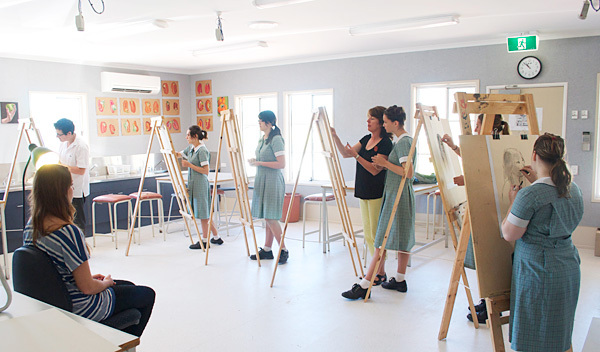 Senior School students also enjoy the use of modern Technical Studies facilities, and Home Economics/Textiles room, as well as outdoor facilities such as basketball courts and sports ovals. The growing area of I.T. is also rapidly expanding at Cedar College, with new computer labs, laptop bays and wireless network coverage throughout the school. Sport and Physical Education is a major focus area for Cedar College, and the new $3M Cedar College Sports Centre has enabled greater flexibility in the area of sports. Equipped with two playing courts for a variety of indoor sports, as well as a weights training area, teaching areas and change-room facilities, the Sports Centre is an exciting new asset for Senior School students at Cedar College.